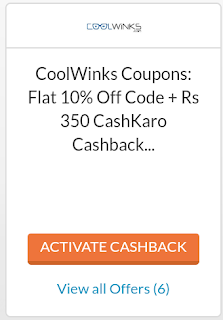 3- Add any product worth 499 Rs or more to your cart at Coolwinks. 4- Now pay via Phonepe and Complete your payment via Phonepe UPI or Debit, Credit card. 5- You will receive 500 Rs Cashback on Phonepe. 2- Verify Your Detailes and Complate YouR Cashkaro account. 3- Now Go to Coolwinks offer Page in Cashkaro and You will see below banner.